When you eat pasta every now and then, you are most likely familiar with pesto. Pesto comes in two colours, red and green. The green pesto is usually based on the ingredient basil and in the red pest you find either tomato or paprika. Pesto is delicious in its own right, but it often used to add spice and flavour to other products. For instance, it is often used to add flavour to pasta, but it can also be used to create the most delicious and colourful cheeses. If you add green pesto to a cheese, you get a flavour with a hint of basil in the cheese. Of course the pesto is made with more than just basil. You also find olive oil, pine nuts and parmesan in the pesto. 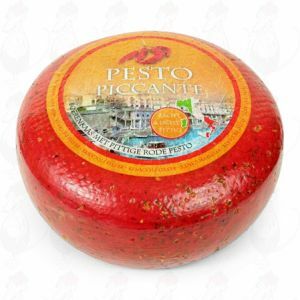 Whether you like red pesto cheese or green pesto cheese, they are both very nice in flavour. Not only that, the colour of the cheese is capable of spicing up any kind of gathering. If you are in the Netherlands, enjoying a typical Dutch gathering of people, then it is not more than logical you put some cheese cubes on the table. Imagine if you do not serve the normal yellow cubes, but red and green cubes. That will add some conversation to the table as it were, because people in the Netherlands are not always used to such things. 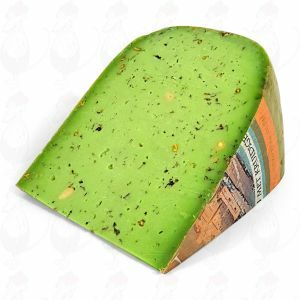 Regardless of the effect, it is important that you can also enjoy the taste and that should be no problem with pesto cheese, either red of green, because pesto cheese is very tasty and definitely worth a try. Cheese is a product that has an expiration date. The cheeses you order at goudacheesshop.com are all fresh. This means that the expiration date is short. To solve this problem and to make sure you do not need to eat the cheese on the day you receive the cheese, all cheeses are packed in vacuum. This means you can keep the chees for up to six weeks (as long as you keep it packed in the vacuum). So whatever cheese you choose to order, pesto cheese or any other kind of cheese, you do not have to worry about the expiration date. Regarding the transport, there is also nothing to worry about. The typical Dutch cheeses usually have a hard cover and this makes it very easy to transport the cheese by post. When you are on the website of goudecheeseshop.com, you can of course also find a lot of other cheeses. If pesto cheese is not really your thing, then you can just browse the various sorts of cheeses. Each cheese comes with a description, so you always know what to expect. You can also use the website for various tools like a cheese slicer or a cheese fondue. So you never have to leave the website emptyhanded.